Now that it's May, most of us likely have our sights set on summer— Warmer weather, a schedule free from school and more fun events to attend. Wilmington, Delaware is a great place to spend the spring and summer months with numerous activities, events and attractions to visit with the whole family. Whether you're relocating to Wilmington or Newark DE, simply visiting for the weekend or wanting to get out and explore the community, consider the following 8 things to do and see. There's something for everyone on the list! FREE! Hands-on activities and exhibits are housed in this 4-story nature center located on Wilmington's Riverfront. FREE! With rotating exhibitions among its seven galleries, this local museum has been called "one of the most innovative and prominent organizations of its kind on the East Coast," by the Philadelphia Inquirer. Here you can find life-size dinosaurs, an African watering hole, undersea adventure and even get up close to a jaguar! Enjoy a stroll, have a picnic, bike from Brandywine Park to Rockford Park. The railroad has become one of the East Coast's premier scenic tourist railroads and is ready to celebrate its 50th season this year. A great place to catch a baseball game, have dinner, watch a movie or enjoy the entertainment planned for the day. An example of early American industry situated on 235 acres along the banks of the Brandywine. Visit the Farmer's Market opening May 6, ride the Wilmington Trolley, tour local shops and businesses. Downtown is a hub of creativity! The KG Home Team is proud to call Wilmington, DE our home and we know you will be too! As your local real estate experts, we can provide local suggestions and fill you in on what it takes to become a homeowner in New Castle County. Now that the spring season is officially here and the busy real estate market buzzing with buyers ready to find their dream home, it's time for an update on the status of the real estate market in Wilmington and Newark, DE in New Castle County! 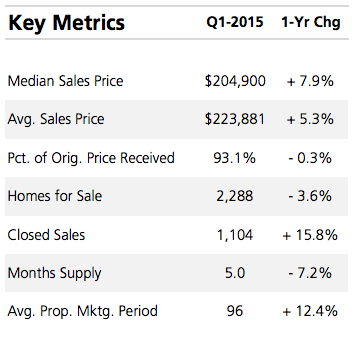 For the first quarter of 2015, there were 2,288 homes for sale with an average sales price of $223,881— a figure now up +5.3% from this time last year. 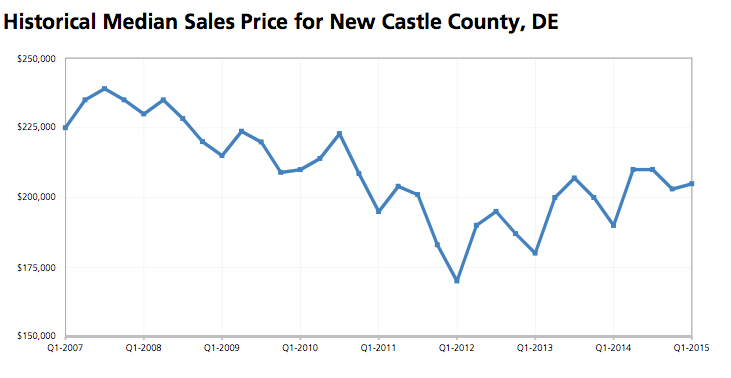 1,104 homes sold within the first quarter in New Castle County—an increase of 15.8% from last year—and area home sellers are reported to have received 93.1% of the original price at closing. Inventory in the area is still trending lower, with the first quarter showing inventory at a 5 months supply— 7.2% lower than last year's inventory during the same time. 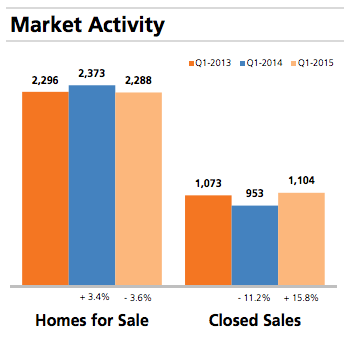 These updated market statistics provide just a brief snapshot of current levels in the local real estate market, so do not hesitate to reach out to us if you have questions about homes for sale in the Greater Wilmington DE area! The top-ranked KG Home Team is here to help with any of your needs from finding your dream home to relocating to selling your current property. When shopping for a home in Wilmington, Delaware, many buyers cite the "green factor" as part of their criteria for making a purchase. Buyers want to "go green" to save money on energy costs and of course, help their home run more efficiently with less of a footprint. One of the ways to do this, as a homeowner, is to install solar panels— these are the reflective panels that sit on your roof and subsequently bring down your energy costs over time. Solar panels are very expensive to purchase—many at a cost upwards of $20,000—or they can also be leased. If you go the leasing route, oftentimes the company will just give you the panels when you're finished. But not so fast! What you may not know as a Wilmington or Newark DE home seller, is that your solar panels could be doing the exact opposite of attracting buyers this spring and in fact, killing your hopes of a successful home sale. The typical solar panel lease could be up to 20 years and in fact, many homeowners do not tend to stay in one place that long. Whether it be due to a job transfer, downsizing or upgrading to a larger Delaware home, the probability of selling your home before your solar panel lease is up is quite high. Instead of simply providing that "green factor" that many Wilmington DE homebuyers are looking for, the leased solar panels will force a buyer to first qualify to take over the lease or buy out the remaining lease before they can purchase your home— pending they even want to buy a property with these installed. Going one step further, if the buyer does decide to take over the solar panel lease, that payment is now visible on their credit report. Should the homebuyer decide to do a refinance down the road, that extra bill on their credit report may push them over qualifying ratios to secure a lower rate. As you contemplate turning your Wilmington, Delaware home into a homebuyer's paradise this spring— complete with energy-efficient appliances and solar panels—first consider the complications that can arise when selling the property. The KG Home Team is here to help make your home selling journey both as easy and enjoyable as possible, so do not hesitate to reach out with any questions about what could raise red flags in your home sale this year. We can fill you in on exactly what buyers are looking for and what can ultimately slow down your sale. Selling your home successfully goes beyond home features, location and timing— one of the most important factors is pricing. Pricing your Wilmington DE home correctly up front can reduce the amount of time it will sit on the market. For instance, did you know that homes that experience a price reduction sit on the market longer and eventually sell for less than similar homes?